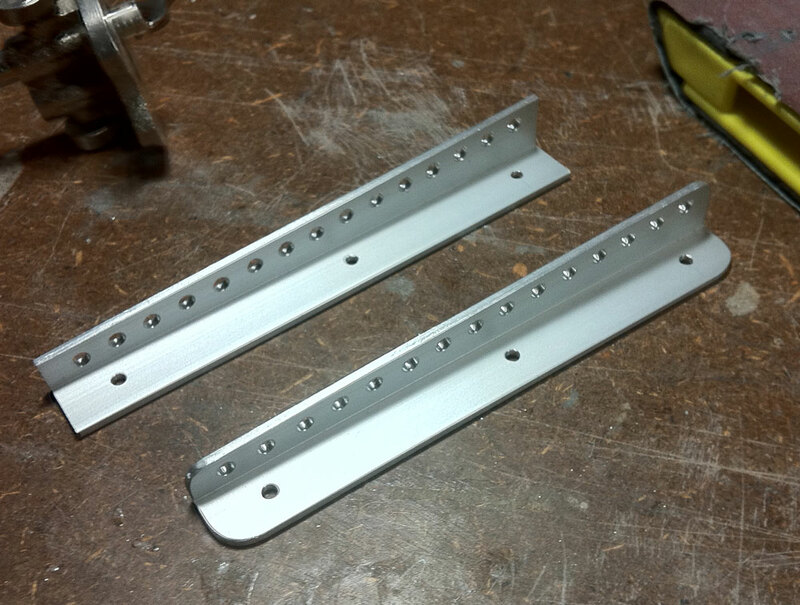 Sponson tube fillets, turnfin L-mount and turnfin(s)! 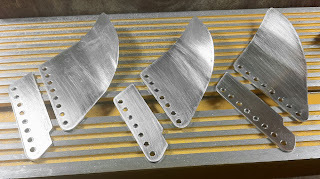 Mix some 30 minute epoxy with milled fiberglass (to make it thicker) and use that to form fillet around the aluminum tubes in the tub and sponsons. Sand the sponson outsides smooth. Lets do the initial set-up of the sponson tubes! My carbon tubes are cut at 470 mm. Push them in the tub-tubes and make sure they are protruding equally left and right. 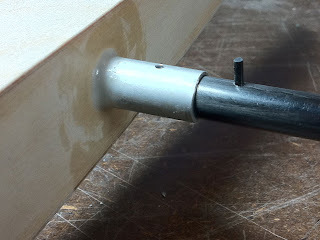 Use a hand held drill machine with a 2 mm drill bit and drill one hole from the top through the pre-drilled 2 mm hole(s) in the aluminum tube in the tub and through one "side" of the carbon tube (only the top side). 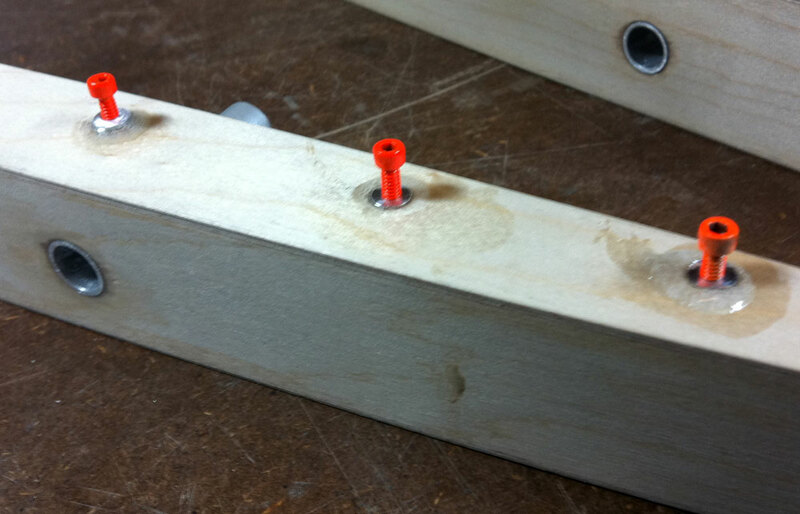 Take one of the 2x12 mm carbon pins and push that through the hole you just drilled. 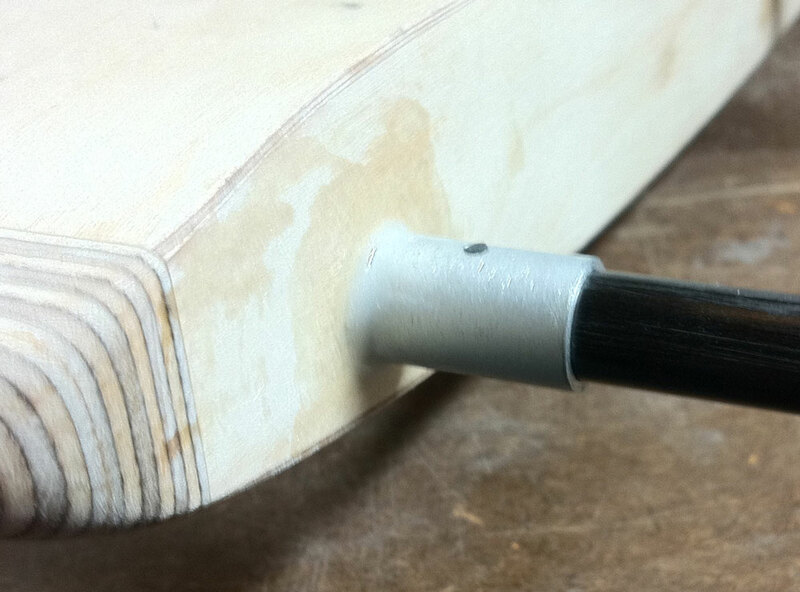 Turn the boat up-side-down and drill the "other" hole from the bottom. That makes one complete hole in the carbon tube so to speak. 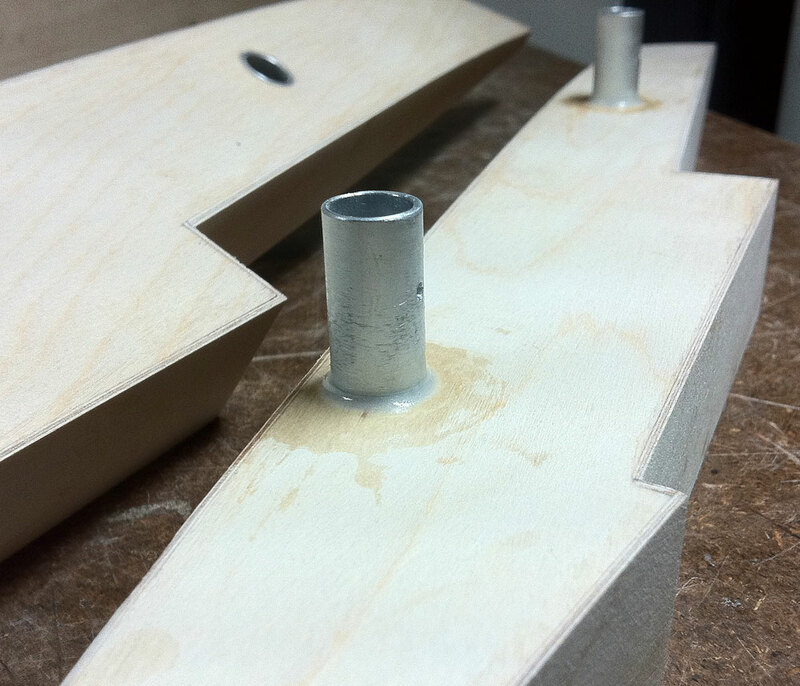 Push the 2x12 mm pin all the way through. Now you have your first locking pin in place and it should be flush on booth sides of the aluminum tube (top and bottom). Continue to do the rest of the pin holes in the tub part. Note, the top picture is just for reference showing the tube being pulled out and the pin is shown semi-through the carbon tube. The bottom picture shows the 2 mm pin pushed through and locking the two tubes together. 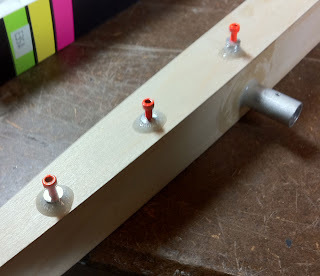 When you are doing the final set-up and assembly of your ready painted T2-21you will only need a small amount of electrical tape over this joint to secure the pin from falling out. Now it's time to lock the sponsons in place. 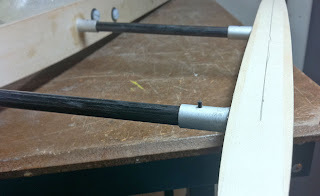 Push one of them over the tubes and with the earlier applied masking tape & centerline on top of the sponson align the sponson to be pointing straight ahead = the same measurement from the center of the sponson to the tub-side - front and rear. 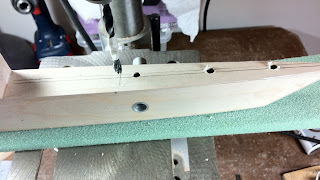 Use the same procedure as when drilling these holes on the tub-side so to speak. Keep checking that the sponson alignment is dead-on. 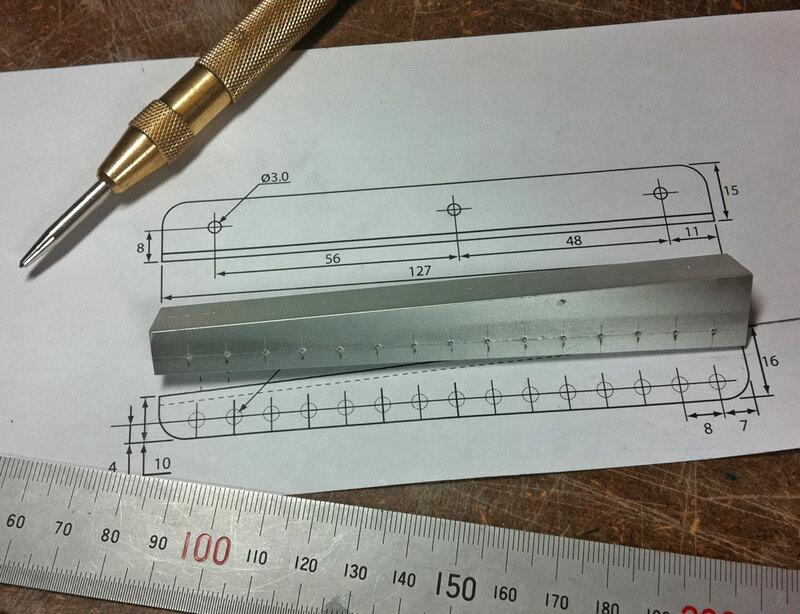 2 mm thick aluminum L-bracket being made for the turn-fin mount. The aluminum quality we have used is "un-known" actually. It's bough over the counter cheaply at Bauhaus here in Sweden. 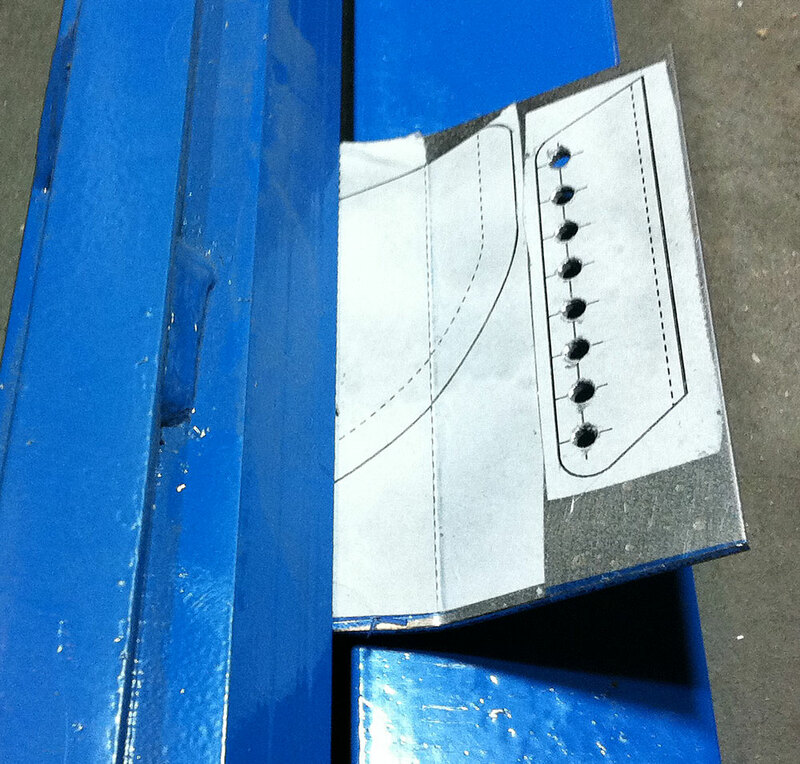 It means you don't need to find a super quality L profile for this purpose - ours has'nt bent yet. The L-bracket drawing is included in the 2of2 pdf. 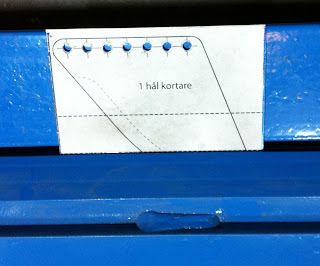 Turn your T2-21 upside down and put some masking tape on the right hand sponson as the picture shows. I made one line that is parallel to the centerline of the sponson as guide to begin with. 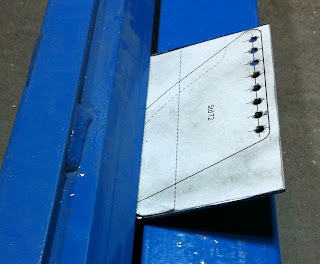 The off-set is 3 mm to the inside. 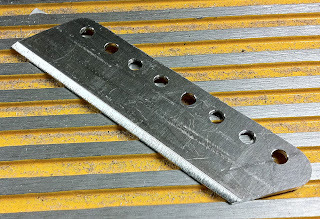 The length-wise alignment of the turn-fin mount L-bracket is that the edge of it should be 55 mm from the vertical sponson step. The three 4-40 threaded 15 mm long 1/4" diameter aluminum inserts. These have the hole all the way through and the end of the hole plugged with some epoxy. Note, in this picture you can easily see that the front hole will pretty much be centered with the sponson tube! 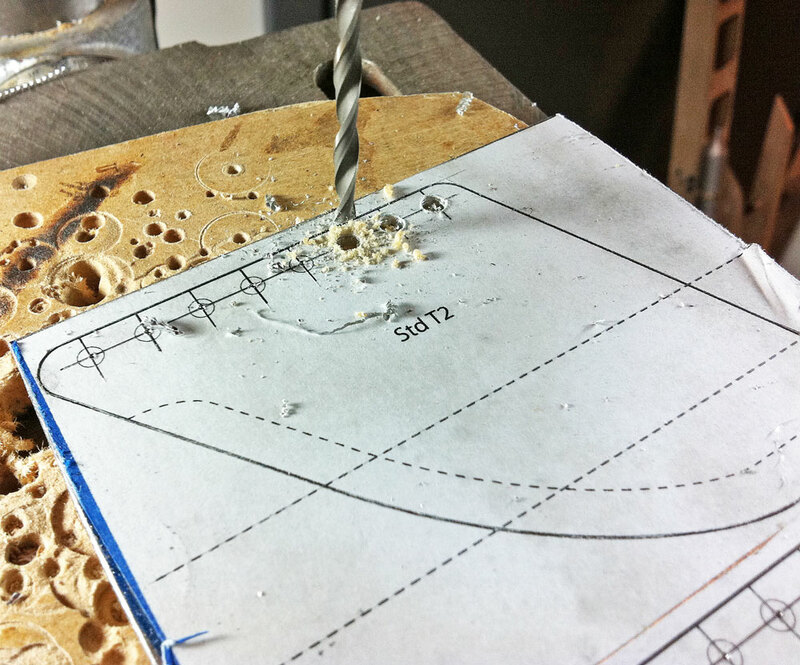 That means you need to pay attention when drilling that hole. 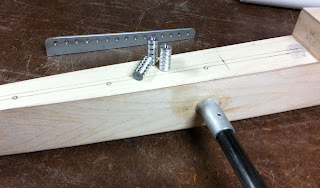 I drill it so the drill bit touches the aluminum but not through of course. 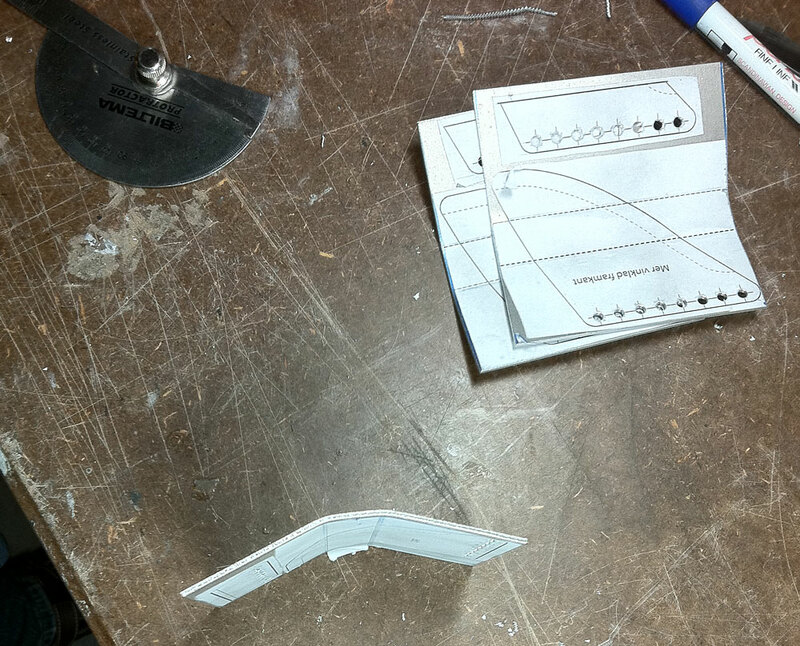 Use the cut-away Divinycell piece again and align the sponson so that the step-bottom/roof is horizontal. 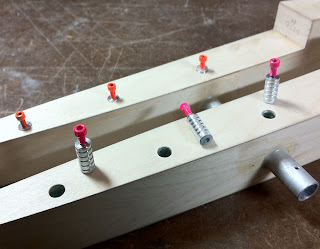 Use a drill press and a brad-point 6 mm drill bit to drill the holes. 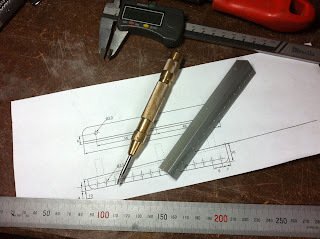 Note the masking tape on the bit that shows how deep you should drill. 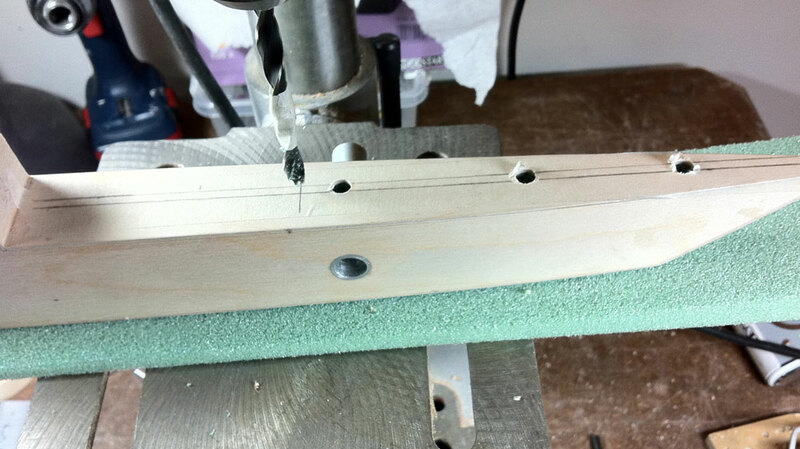 When these 6 mm holes are done change the drill bit to a std 6.5 mm one if you are using 1/4" dia inserts. Make sure you don't drill the rear hole through the sponson tube! 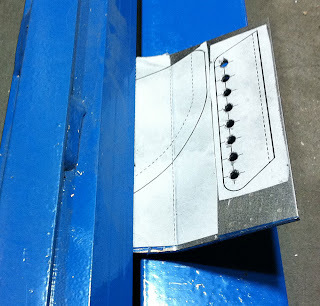 Dry-fit the inserts. Make sure that there is some play (that the hole dia is slightly bigger then the outside dia of the inserts) and they fit good. 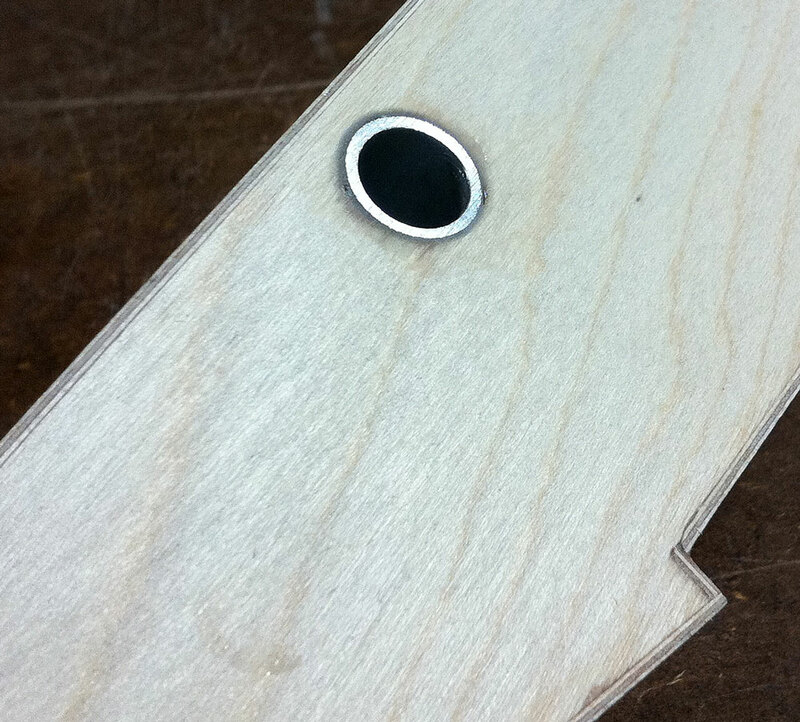 Use some sand paper and roughen the surface of them just before you will glue these inserts. 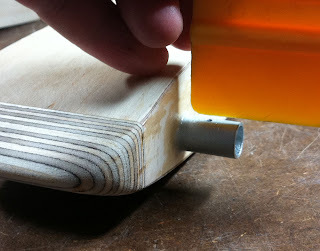 When the epoxy has set over-night you can start sanding the protruding inserts parts flush with the sponson. 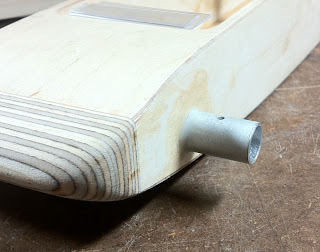 Take your time as the sanding will crate some heat in the aluminum insert and you don't want it to get too hot. Cut-out the turn-fin part of the printed 2of2 pdf. In this picture you can actually see three different T2-21 turn-fins to be made. 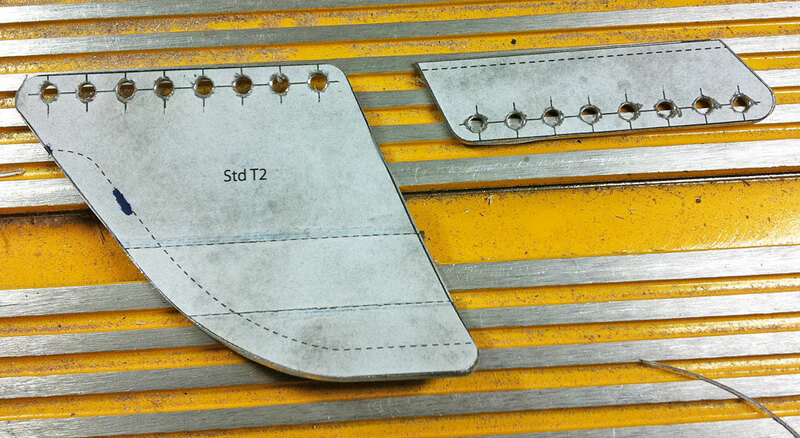 One is the std T2 fin that is included in the pdf's. 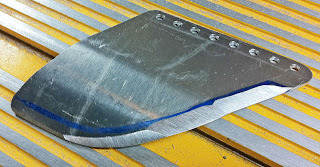 But I will also test a couple different ones this upcoming season. 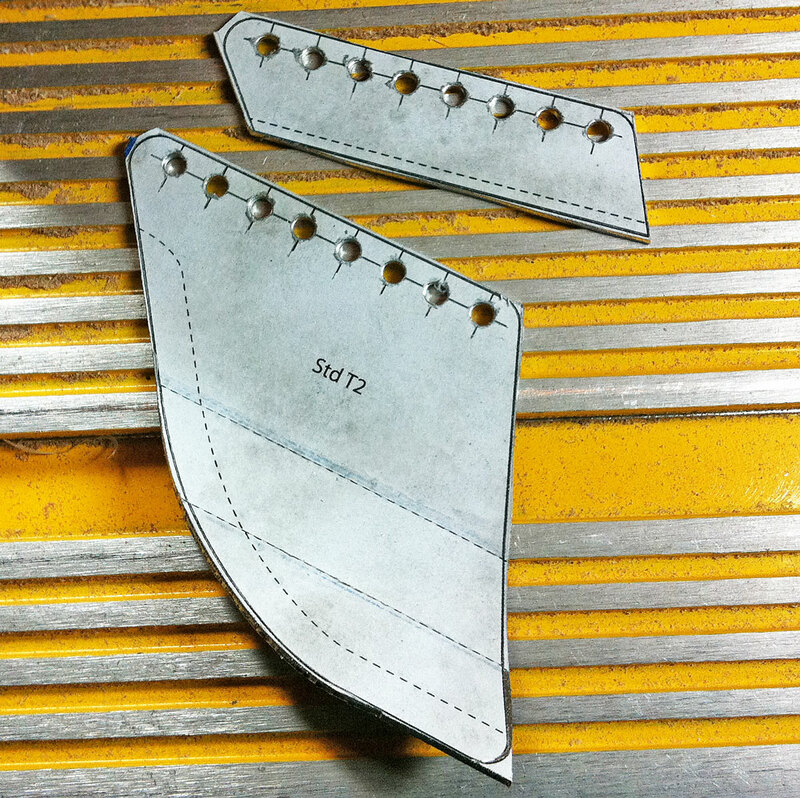 One of those development fins is "one hole" shorter = 8 mm. The second new one is the same length on the top part but the leading edge is more sloped backwards then the std fin. 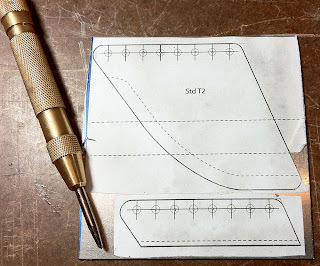 FYI: The included (in the original pdf's) std T2-21 turn-fin is based on the JAE 21 fin but modified as the T2 fin is mounted differently and it's shorter then the std JAE fin also. We for sure will test more fins in 2013! I'll keep you posted on how the testing goes. :) If you want to try any of these development fins you can download the A4 sized pdf with them HERE. 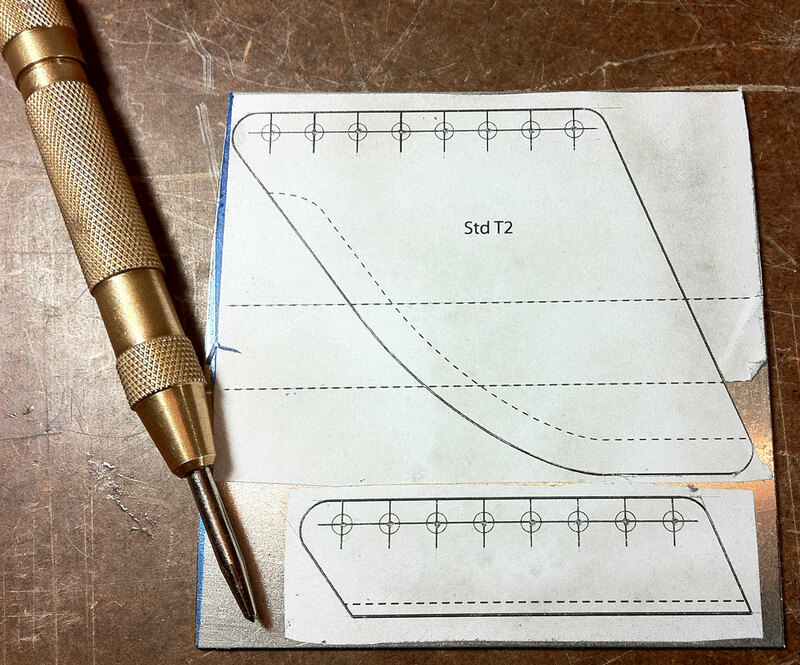 The std T2 fin is included also in that pdf. 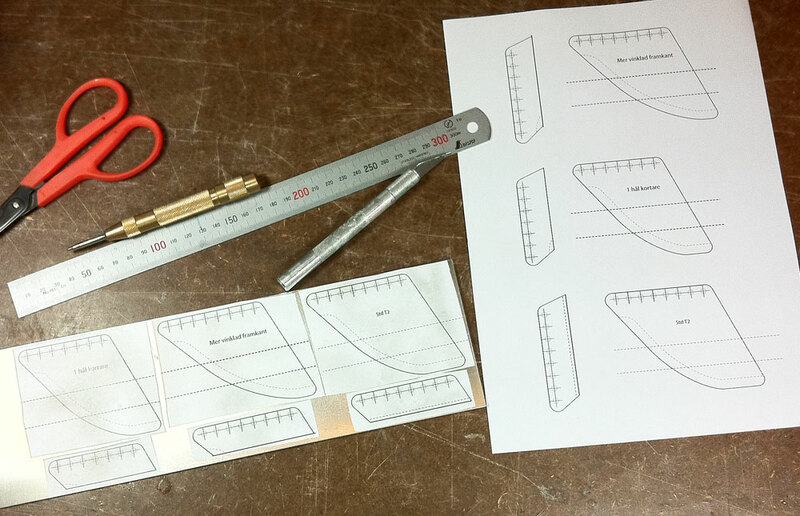 The printed out turn-fin and the turn-fin doubler is attached to a 1.5-1.6 mm thick 7075-T6 aluminum sheet about 100x100 mm in square. Use normal spray-glue. Use a steel ruler to mark the hole centers and punch a drill-guide dip in each center. 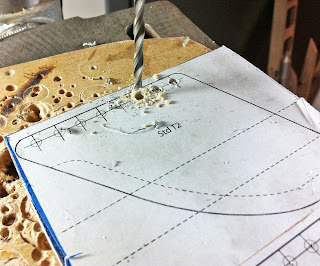 Drill all holes in a drill-press (in the fin and doubler) with a new 3.5 mm drill bit. De-burr the holes from booth sides slightly. 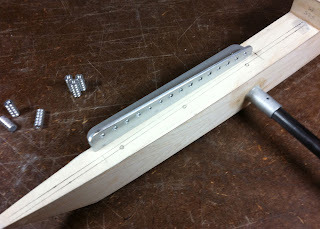 Use a bench bending device and do the lower bending first. 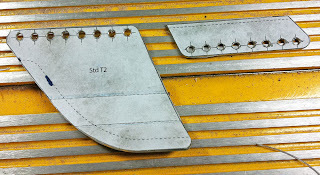 You need to bend it slightly more then the actual 17 deg bend as the 7075 will spring back so to speak. Remove it and check the angle and bend it again until you are happy. Turn it around and do the upper bend. Done. 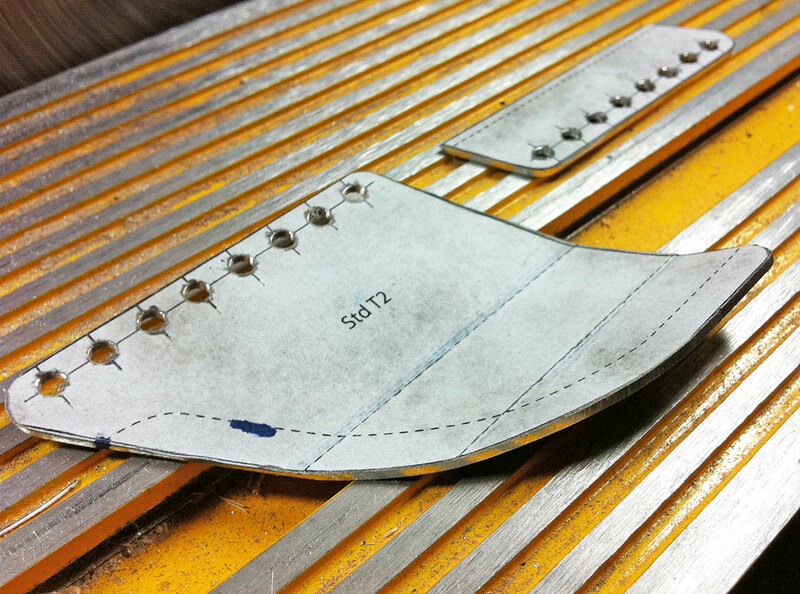 Now ready to be sawed out. Use a band saw to cut them out. 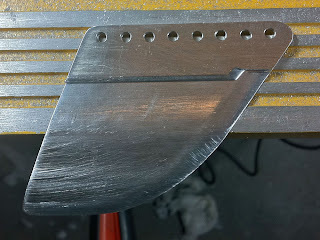 I use a disc sander to make the edges straight and flat but you can use a std file also. Flip it around and use a pen to mark on the outside where the sharpening will be done. Again, this is done on the disc sander but you could use a file to do the majority of the work but it takes quite some time to do it manually. On the top picture you can see that the left fin is just done in the disc sander and the right one has been hand filed. Make sure that the filing is done horizontal so to speak. 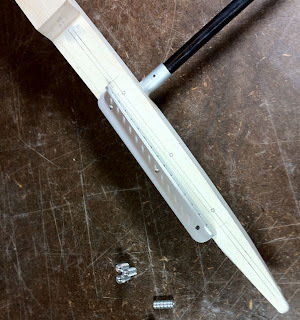 Note, at this time don't make the sharpened leading edge too "sharp". 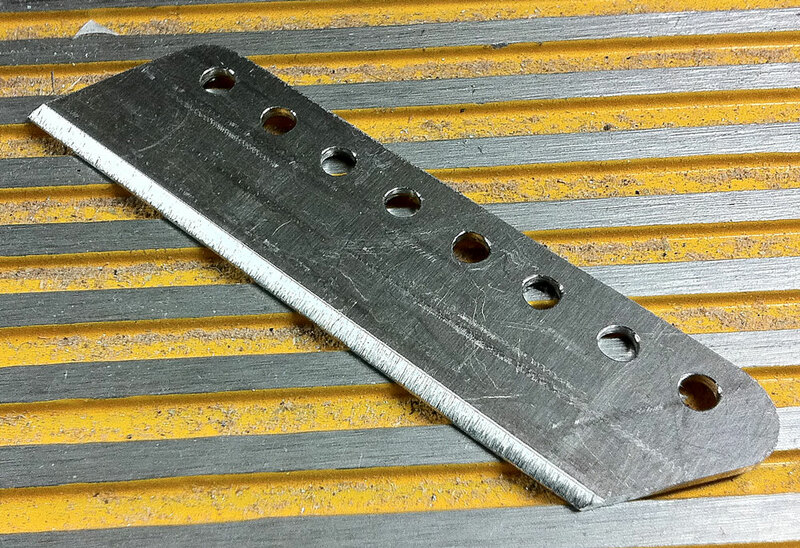 Leave a flat spot of a few tenths of mm. If you make it too sharp it will be too fragile (at least at this stage). 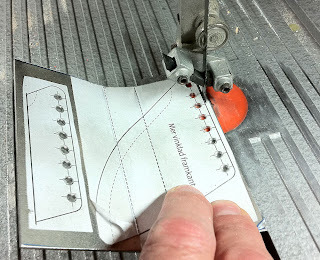 You will need to make a small notch in the turn-fin doubler to match the turn-fin. That also is sharpened to match. The complete turn-fin and doubler is then sanded smooth. 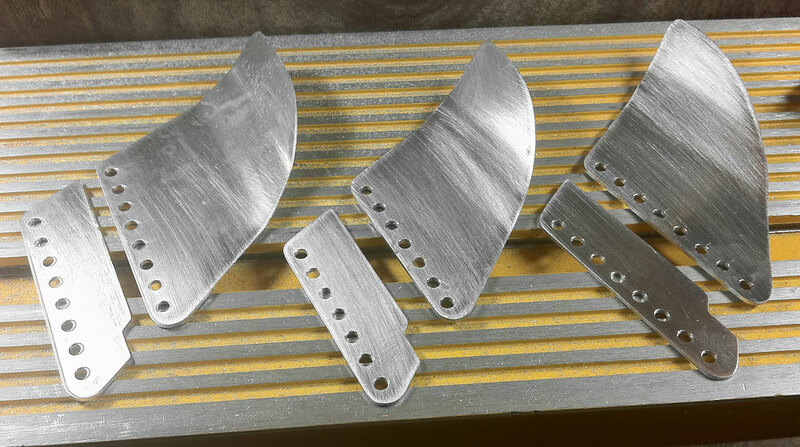 The last part of the sharpening is done with sanding also. 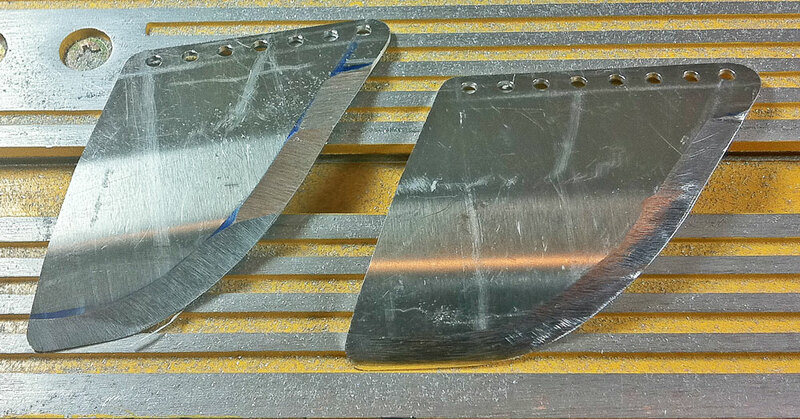 Sanded also on the inside flat parts. De-burr the sharpened leading edges slightly with sand paper.